Outertech's system tool Cacheman offers the best methods to speed up Windows 10, 8.x, XP, Vista, and Windows 7. 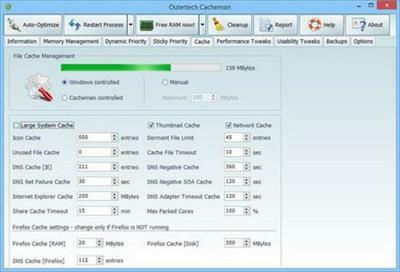 Cacheman optimizes several caches, manages computer memory (RAM), fine tunes Registry settings and speeds up the PC by dynamically changing process priority. Auto-Optimization makes Cacheman suitable for novice and intermediate users yet it is also powerful and versatile enough for computer experts.